I've been slow writing posts in general, and more specifically finishing my California posts . My goal is to finish writing these posts before I leave for my next wedding vacation next week! Really, there are only two left: the rehearsal and the big day! Doesn't this entrance look quintessentially Californian with the bright sun and palm trees? On the night before the wedding, Cathy and Vern invited all their out-of-town guests (which totalled a whopping 75 I think!) 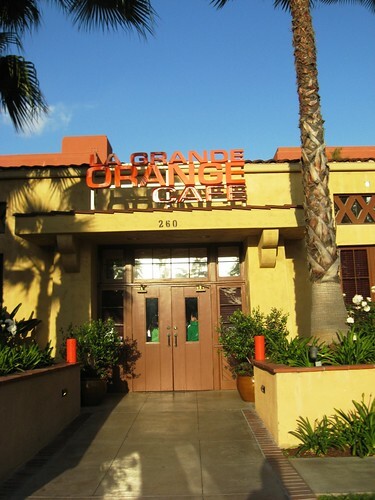 to La Grande Orange, which The Gastronomer had previously written a post about, generously hosted by Vern's parents. To start with, I got to munch on deviled eggs while mingling with the couple's family and friends. 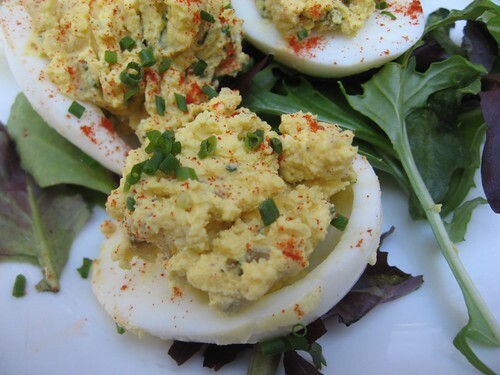 Deviled eggs always hit the spot! 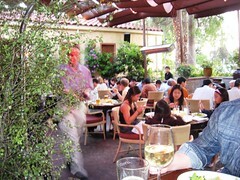 Cathy and Vern had reserved the yard which was a perfect spot for dining! 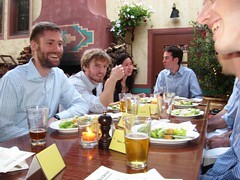 I got to sit at the head table, in the company of Cathy's and Vern's old college friends, many of whom were very fit runners! 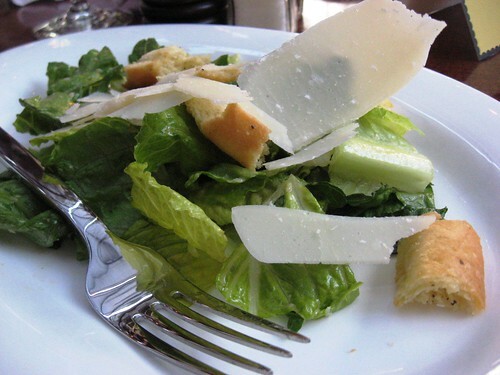 We were first served a chopped caesar salad, garnished with large shards of cheese. Can't go wrong with that! For our entrées, we were provided three choices. Luckily, I was able to snap pictures of my neighbours' dinner. Unfortunately, it had gotten dark, so my pictures are not the greatest. 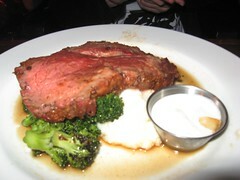 Cathy's college friend T's prime rib was served rare just as she requested. I like girls who eat their meat bloody! 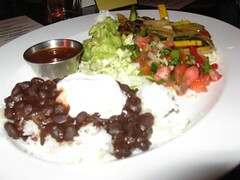 The vegetables in the vegetarian taco dish were very colourful and were served with house-made corn tortillas. Talk about two extremes: prime rib and vegetarian tacos! I ordered the roasted organic chicken, after Cathy excitedly informed me that it was Jidori chicken, currently all the rage in California. I even read a New York Times article that she had linked while I was still in Canada. Jidori chicken is a type of free-range chicken grown in Japan, so technically this chicken was raised in California in the Jidori fashion. I loved the simple chicken with its crispy skin. Could I detect anything in particular? I think my palette is not quite that distinguishing, but the chicken was delicious! 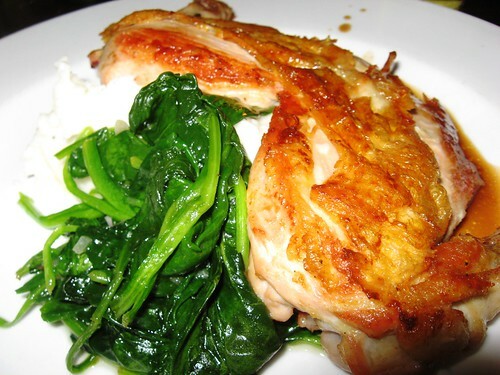 Jidori chicken served with spinach. 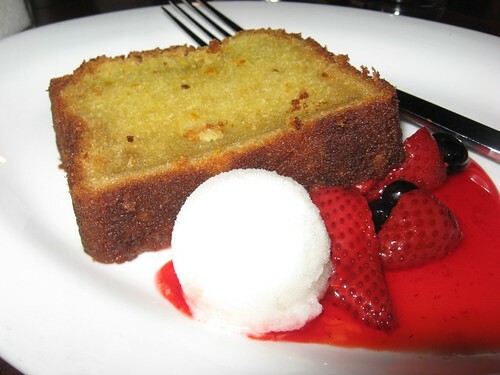 While I was stuffed to the gills, I still managed to eat olive oil cake. It was nice to finish up the meal with a dessert that was not too sweet. 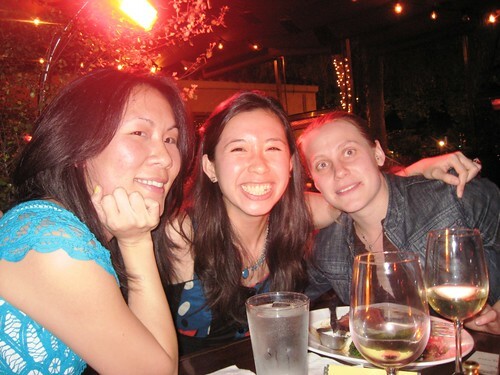 Cathy with her college friends, including Lucious on the left who was a fellow bridesmaid! Finally, after a nice thank you speech, Cathy and Vern presented the wedding party with some presents. 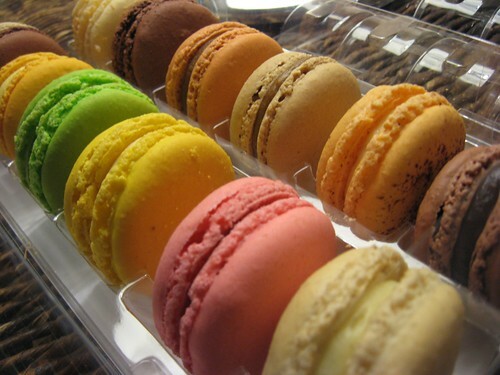 I got to go home with a box of very beautifully colourful macarons. Lucky girl I am! What a fun night and the last post will be the wedding!! My macarons that I saved for home. Squeee! Thanks for the memories!